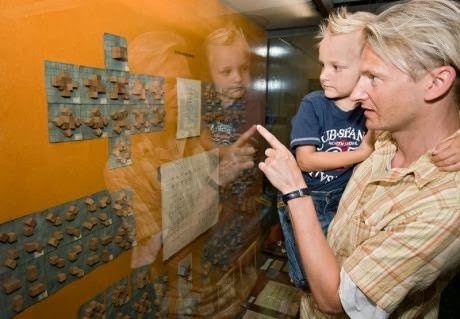 A father introduces his son to Froebel's gifts. As I mentioned a week or so ago, I had attended the local school board meeting in which school reports were offered, regarding test scores and various programs. One of the programs is that called "gifted and talented." The teacher in charge of that program throughout Eureka Springs Public Schools prefaced his remarks with the idea that all children are in some ways "gifted and talented," but that the state offers specific funding for his program that must not be ignored. And so, it could be reasonably stated that we have a gifted and talented program to get state funds at student expense. The "Gifted and Talented" child profile covers those smart children who would be totally bored in school if they were not offered something to do. And so these kids are pulled for periods away from their classmates and set apart as those who have both special opportunities and are recognized by the system as being superior in some way. Gifted and talented is a program that parents generally support because they want their own children's gifts and talents to be acknowledge by others, particularly in school. And those parents with "gifted and talented kids" are usually those who who have a greater level of persuasion when it comes to school board policy. The idea of "gifted" is also problematic. Usually students with recognizable "gifts" are those whose parents have the greatest level of participation in their children's learning, "gifting" them opportunities in the form of museum visits and educational resources in the home unavailable to children living in poverty and whose parents may be working two or three jobs to make ends meet. The problem of bored children who may have greater intelligence than average, or are developmentally advanced is one that falls into the problem of class teaching and graded schooling. In real life, where our learning is seldom "class learning" and we are no longer assigned to specific grades, we may be tested by circumstances to achieve real objectives. The artificiality of schooling sets it apart form real life. To be honest, I consider the notion of "gifted and talented" as being an invention of the 60's that should be eliminated from schools. The notion is elitist and offensive. If we recognize that all children have potential gifts (areas of interest) and talents (skills resulting from application of effort), then no child should be set apart and elevated over his peers by anything but his or her own efforts and schools should be equipped to recognize and employ a diverse range of talents (skills). 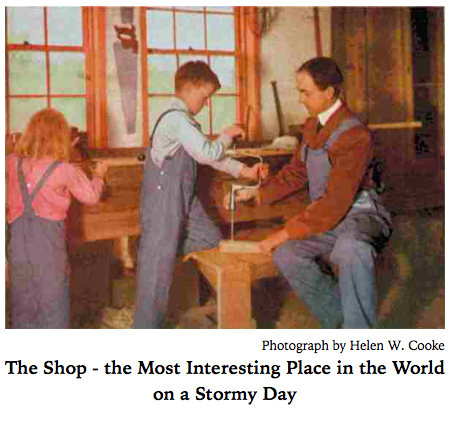 The wood shop is one area of schooling in which all the forms of human intelligence can be explored and activated, and if every school was equipped with spaces in which hands-on learning might take place, and if all children were able to explore their own capacities freely in such places, we would have schooling in America vastly different from what we have now, directed toward much greater and more meaningful lasting effect. Today in the wood shop, I will be sanding boxes, and applying Danish oil finish. An article in Education Week claims that Technology Isn't Bad, It's Character Building. Of course wrestling through difficulties with technology can be character building in comparison to sitting around doing diddly squat all day or in school. Trying to saw a straight line can have the same effect. In fact, Ruskin had noted that to take a thin shaving from a plank or to lay a brick level in its mortar would mold a man's character in ways that words alone could not. But the basic thrust and selling point of technology, including digital technology is to make things EASIER, requiring less skill and more certain, at less expense. Character, on the other hand often arises from doing difficult things. Some people call that kind of character "grit," or "determination." Schools should also be the place where difficult things are done to mold a willingness to embrace challenges: those that will come one after another inevitably from life. Digital technology is an equalizer, but only in that anyone who can afford the technology can do amazing things easily, without effort and certainly without any particular exercise of determination or skill. For the sake of comparison when it comes to character, have students craft something useful, beautiful, or both. In a parallel matter, I had downloaded the new operating system El Capitan to my Apple computer and laptop and had difficulty getting my mail functioning right. It was a challenge greater than what would be faced by kids in school trying to get their iPads to download necessary apps. Perhaps I should be thankful to Apple for the work they did in fostering the development of my character. In any case, it did feel good when I managed to get my mail working right on both computers and without having to call for technical support. It also felt good to share what I learned with Apple so that they can make things easier for others. Yesterday I had a remarkable day in the wood shop at Clear Spring School. As an activity for our annual harvest party, we made native American totem necklaces upon which students from pre-school up to high school stamped power words, letter by letter using a metal stamping set. We adorned their power totems with feathers tied with artificial sinew. 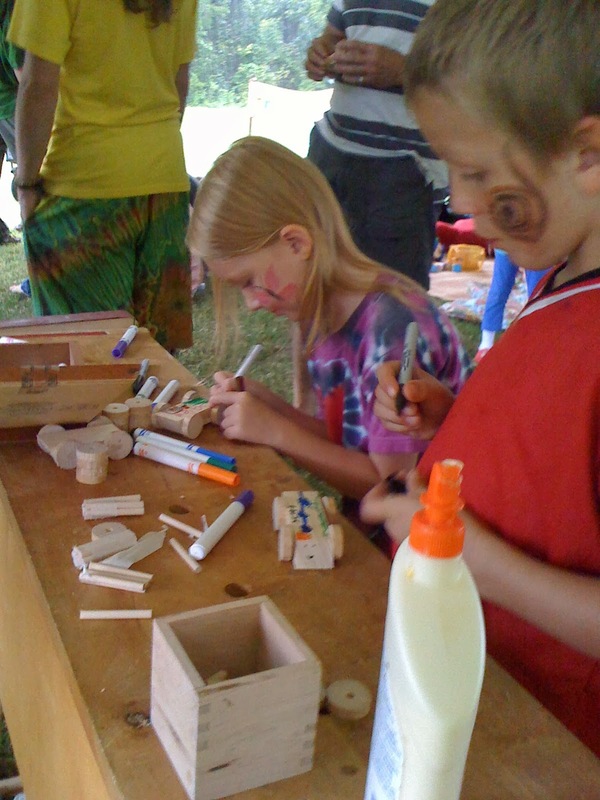 At one time, I had about 6 pre-school students and their mothers and teacher in the wood shop, each waiting their turn to make a totem piece of their own. I asked one little boy what his power word is. J-O-E he replied. What power there is in such a simple name! I asked one of my second grade students what her power word would be. "Water" she replied, but then upon further thought added "and rainbows," noting the connection between the two. She stamped the word water, and then used markers to tell the rest of the story. The idea that character must be built upon artificiality is mesmerizing. The children who came through my shop were not lacking in character, noble aspiration, or compassion for others, even at such an early age. One of my 5th grade students was in the wood shop working on his power totem when the pre-school students arrived in a sudden flood. I felt suddenly overwhelmed. Garrett stopped working on his own totem and began helping the pre-school students with theirs. He looked up at me in the midst of being so busy, and said, "Now I know how you feel sometimes in class." The ability to empathize with another is an aspect of character that may be hard to teach, but that may be discovered and preserved in the right learning environment. The point here is not that character must be built, but that it must be allowed to flourish. The artificiality of schooling can convince children that the essential points of character may not matter. But challenge the students to make beautiful and useful things, and character will stamped in bold letters within the school and in the community at large. The photos at the top is of one of my high school students helping her little sister (3 years old) in the wood shop. As you can see in the photo at left, box parts are becoming boxes, as I prepare to fill holiday orders. Make, fix, create, and please enable others to learn likewise. If a tree falls in the forest and no one is there to hear, does it make a sound? You know the question. I heard it posed three times yesterday. Or maybe that was just twice. But when philosophers go off the deep end, people can talk about it for years. The stupidity of the question is the presumption that if a thing's not been measured by man, it may not have any basis in reality. Tell that to the billions of years of planetary evolution upon which our own evolution stands. The same stupidity has infected education through the assumption that if learning has not been measured in standardized testing, no valid learning has taken place. And yet, we know students learned in schools and learned better in schools for years before our educational policy makers became obsessed by the test. Today, the kids at Clear Spring School are excited. Prior to the fall break we have our harvest party in which students dress in pioneer fashion and develop games for the entertainment of each other. Ian and Lily, for instance, plan to have a magic act in which they will saw Ana in half using a large carpenter's saw from wood shop. These are not the kinds of activities that you can measure. What did he or she learn from that? You want me to be precise, or can we just flow as though schooling is a part of natural life in which children learn, play and grow just as human evolution has evolved from every tree that fell in every forest whether or not the sound was recorded and thence forgotten by human ears? For some policy makers and administrators to have children's lives reduced to statistical data that they can manipulate to increase funding makes sense. Fortunately we seem prepared at long last to escape such foolishness. N. Christian Jacobsen talked in his book and lectures about finding the ideal teaching circumstance and placed emphasis on the necessity that schooling take place within a social setting. For the child needs the influence of many, besides the closest person or people involved in bringing him up, and is affected by his whole environment, both living and inanimate nature which has and must have an influence on his development. Given that the child is created by and shall be educated for life within community, it requires among other things, to be put into social relation with peers during this education. The Clear Spring School is much more than a school in which lessons are administered and measured. It is a social setting in which children learn and grow in relation to each other and to caring adults. Of course similar things can be said about most schooling. But if a tree falls in the forest, it does make a sound and have impact on all the life that surrounds it, whether it's been heard by man and thus measured or not. I am making gradual progress in my boxes. The photo above is of cutting the angled tops of pencil boxes. finishing bows, playing gaga and box making. My students at Clear Spring School are finishing their bows and with only a couple exceptions are as interested as I am in the quality of how they turn out. There is a magic in holding something you've made whether or not it reaches a level of proficiency and perfection. The bows have the power of launching arrows, and so there is an excitement building toward putting them to use. At the beginning of our school year, the GaGa court we had made a couple years ago was idle most of the time, but having put just a bit of energy into restoring it has brought it back to mind as you can see in the photo above. The game starts with kids of all ages and sizes crowded into the small court, but the number of students inside quickly shrinks as the ball taps legs. Some of the smaller children are over looked at the beginning of play, and often stand up to the taller kids who have more body exposed as target due to their greater size.The ball has to be kept low to avoid exiting the court, and so is never hit with enough force to injure even the smallest child. In my wood shop, I've been cutting slots for barbed hinges. I've devised a new system of locating the part on my shop made hinging machine and it was a pleasure to work so effortlessly and accurately with a machine I made myself. In the meantime, I've been trying to get into the text of N. Christian Jacobsen's book and give it the attention it deserves following Barbara's translation from Norwegian. I've had so many things going on at once that it has been difficult to find time. Make, fix, create, and extend the power to others to learn likewise. The following is from my blog post of September 27, 2006, and I am re-posting it here in response to the standardized testing movement and what it is doing to our nation's schooling and in response to a comment from Tim. David Pye, UK woodworker, philosopher and author explored the meaning of craftsmanship in his book “the Nature and Art of Workmanship”. The book questions many of the typical assumptions about the values inherent in work and the products of manufacturing and craftsmanship. Pye differentiates between “workmanship of certainty” in which the processes are mechanized, engineered and controlled to achieve a certainty of outcomes and “workmanship of risk” in which the outcome is less predictable and largely dependent on the attention and skill of the craftsman. This morning as I was brushing my teeth, I couldn’t help but marvel at the simple invention moving through my mouth. It has an ultrasonic vibration that helps to remove microscopic particles, and it cost $3.87 at the local discount store. It is obvious that modern manufacturing is able to offer significant value in the goods made through what David Pye calls workmanship of certainty. If I were to attempt to make a simple toothbrush, I could spend much more than a day doing it, and still not be able to make one myself that would be so effective. Or, I might go outside and with prior knowledge and experience, simply choose something from the range of available natural materials that would suffice, but it would be far less effective than the tooth brush I used this morning. The age of cheap manufactured goods has called the life of the craftsman or maker into question. It is an old problem, and one that John Ruskin attempted to address long before David Pye. How do we come to an understanding of the value of the handmade object? What are the attributes that give it value? In most circumstances, a handmade object can’t compete with a well-designed manufactured object in either usefulness or price. So where does it compete, and why would someone want to either make or purchase something made by hand? If you are interested in this question, reading David Pye’s book is a good place to start. Personally, I think the answer lies in an exploration of our own values. If we are a “values damaged” society as suggested by Matti Bergstöm (see post of Thursday, September 14, 2006 this blog) and are only able to think of the objects in our lives in the economic terms of supply, demand, price and marginal utility, we might as well forget the hands and all the higher values in human life… things like love, the miracles of growth and the joy of discovery. But if there are other values at work in our lives, we will always have a need to be making things with our own hands and to treasure things made through the inspired hearts and skilled hands of others. Tim asked if I saw a relationship between the craftsman's dilemma and what children face in school. The same search for false certainty and avoidance of risk is driving school reform. Just as we want machines to crank out tooth brushes at such a low price, policy makers want the same of education. 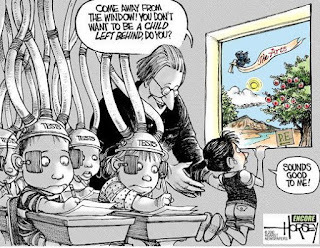 Standardized testing is part of that scheme as "educational reformers" try to use measurement of children's performance to cut costs and achieved new standards of efficiency despite the damages that ensue to the culture and to the soul of the child. There have been many who have described American education as an industrialized process. It is time to re-humanize things. We can do that quite simply by training teachers to be effective (and that means hands-on), and trusting them to deliver, instead of tying their hands with standardized tests and stratagems controlled from the top. I mentioned in the title of this post, machine teaching and mediocrity. 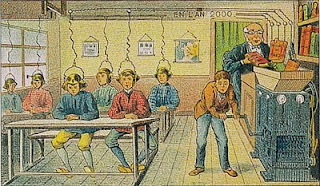 What is happening to teaching with the widespread use of digital technology in the classroom is very much akin to what happened in the industrial age to the making of things. So, what is a man making when he makes something beautiful and useful and what does that have to do with mediocrity? Certainly, and with some degree of certainty, a machine can make things faster and in some ways better than can a man. But when a man makes something, he, himself, has the opportunity to escape mediocrity in the making of himself as a craftsman. While the machine is in the process of wearing itself out making meaningless stuff, the man, on the other hand, hones and polishes his own soul. Make, fix, create and inspire others to learn likewise. too much testing? Let's get real. President Obama and the Department of Education have finally admitted that schools and the Federal Government got carried away with standardized testing. Obama said, "Learning is about so much more than just filling in the right bubble." He called for capping the time devoted to standardized testing at 2 percent of classroom time and recognized that the Federal Government had been a contributing factor in a big mistake. Democrats and Republicans have been at odds over many things, but joined at the hip when it came to pushing the standardized tests. Cutting back on the standardized testing juggernaut is a step in the right direction, but may I remind you that when students are doing real things, no means of abstract testing is required to measure their success. Every school district has reading specialists to coach children to become better readers and to coach teachers to be better at teaching that important subject. We need coaches and specialists to help teachers develop strategies to engage children's hands in doing real things for which they can be authentically assessed. I hope this blog serves as a coaching tool. It is time to get students out of desks and classrooms off their butts. The hands are our best instruments to take a new lead in learning. There is absolutely nothing wrong with assessment. Even before the days of standardized tests, teachers had means of determining whether or not students were progressing in reading and math. Teachers observed students in real time as they became capable problem solvers and learned to get along with each other. And so the great stupidity of modern educational policy is that teachers are no longer trusted as observers and assessors of growth except through 3rd party standardized tests. If the movement to restore sanity to American education continues at an ever increasing pace, I may get to retire from writing this blog. This article about the Joyful, Illiterate Kindergarten Students in Finland may help to explain what I have in mind. When I visited the University of Helsinki for an educational conference in 2008, I visited the university wood shop where Kindergarten teachers working on their masters degrees were learning to teach wood working to their kids. That would be the right kind of education to launch in the US. Yesterday and this morning I took photos of lots of tiny boxes, along with small objects to indicate scale to the viewer. 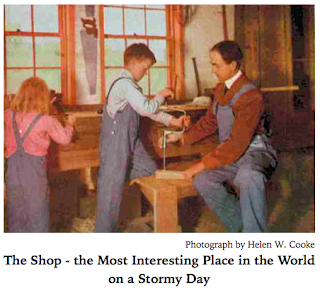 Tim sent this link: Among Dartmouth's Lathes and Saws, Lessons in Creativity. An article about a few folks clinging against the tide to what has always worked on the human condition. We make, we learn, we grow in character and intelligence through the collaboration of hand and mind. Many graduates of Dartmouth have clearer memories of the time they spent in the school wood shop than of any of the classes they took. Yesterday I applied finish to many of the tiny boxes I've made to prepare them for photography in my own wood shop and for shipping to Taunton Press so they can design a cover image for the Tiny boxes book. I also attended a reception for a good friend with whom I helped to found the National Water Center and worked to heal the springs for which our small town was made famous. It is hard to believe that was almost 40 years ago. We were ambitious and thought we would change the world. In addition to starting the National Water Center, (a 501-C3 organization) we also proposed a National Water Week and celebrated it with compost toilet building workshops and musical events. 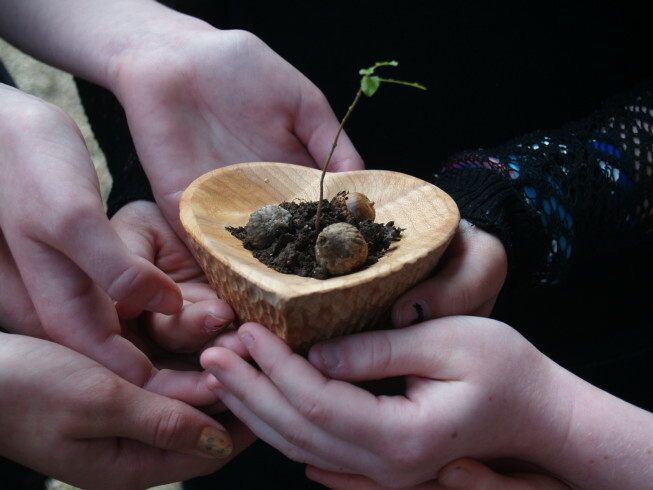 We thought we would create an ethos of environmental responsibility. Most of the world, it seems was either not listening or was headed in the opposite direction. In the meantime, some of our work with Save the Ozarks bore fruit yesterday when the Safari Park in Gentry, Arkansas was awarded a jury settlement in its lawsuit against SWEPCO in the amount of $917,000. SWEPCO had agreed to pay $37,000 for eminent domain in taking land from the Safari Park. The owners of the Park appealed and based in part on evidence provided by Save the Ozarks the jury awarded them 25 times the earlier settlement. We proved the power line was never necessary in the first place, and the jury agreed that SWEPCO should pay damages. We hope this is the beginning of a new day for the power grid in which companies are forced to consider service over profits. Managing a class is a lot easier when you have something for your students to do. Yesterday I made .125 scale model 2 x 4's. for the school's building club. According to the scale 1 1/2 in. equals one foot. So I tried to hold the student's attention while working at the white board multiplying various real dimensions to learn their sizes in scale. Lily said, "I'm sorry I don't do math on Fridays." And while she knows she is good at math in math class, the things learned in math classes don't generally translate outside of class without practice doing real things. Going from the abstract to the concrete is not as effective as teachers would like, and actually applying math to the real world is not as easy as one might think. In any case, we managed to determine the various lengths of 2 x 4's at scale and made 8, 10, and 16 foot scale model so that scale model walls could be made. I taped pieces of wood together in bundles so the students could cut them to lengths using a hand powered frame miter saw. I plan to make more 2 x 4 stock, and perhaps some 2 x 6's also, so that the building club can make various components for a model building of some kind when their usual club teacher returns from New York. The students used glue guns to assemble the walls with the studs placed on 2 in. centers. I cut the model stud stock from real sized 2 x 4 studs. A model stud at .125 to 1 in. scale is 3/16 in. thick and 7/16 in. wide, and an 8 foot stud is 12 in. long, so this is an easy scale to work with and many lengths of stud stock can be cut from a 2 x 4. I advise cutting the real 2 x 4 in 4 ft. lengths first, then ripping strips 7/16 in. thick, and then ripping those in strips 3/16 in. thick. The great thing was that once the students were given something to do, the work became quiet and intense concentration ensued. In the meantime, the President of the US and the department of education have acknowledged that standardized testing is a policy that has gone much too far. Sign this petition to join others in demanding that they listen to the concerns of parents and teachers and involve them as they craft a new standardized testing policy. In my own shop I finished inlaying lots of boxes yesterday for fall orders, and will take a break from box making to finish and photograph tiny boxes for the book. I would like to share my sense of outrage over what is happening to our Southern forests. We know that trees are essential to human survival. 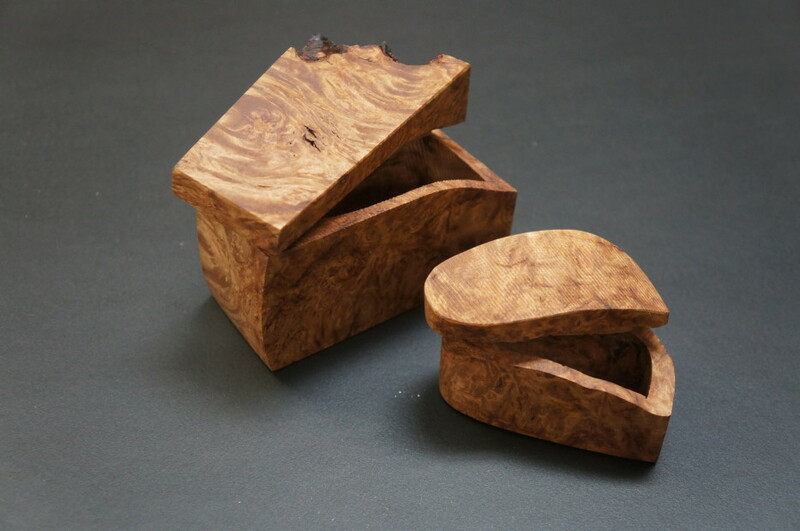 As woodworkers we are dependent on the materials supplied from the trees of our forests for our creation of beauty. We know that trees that have grown in a natural forest provide wood with character and greatest beauty. We know that the forests give life to the planet in a multitude of ways, only one of which is to convert carbon dioxide to oxygen, thus acting in reverse to global warming. We know the roots of trees control erosion and hold back the floods, that impoverish the soil and damage lives and that their leafy boughs fertilize the soil and sustain wildlife. So, let's talk briefly about what is happening in the forest industry. Chipper mills. Whole forests are being mowed down, hauled away and pulverized to make pellets to feed power plants in Europe. There they consider wood products to be renewable energy. But how many years does it take to renew a whole forest? And what are the long term consequences? When I moved to Arkansas in 1975, this place was forested and lovely. Over the years, thousands upon thousands of trees were cut and turned to pastures for livestock and clearings for gas stations. Whole forests were bulldozed into piles and burned as though the trees do not matter. I can assure you that when the forests are gone, they may not be coming back, and the idea of renewable requires first that we renew and take an active hand in preservation. There is no way on earth that chipping whole forests into pulp and burning them in power plants is a reasonable solution to global warming. In fact, the loss of forest resources is a particular horror for those of us who enjoy the beauty of wood. You can read about the growing crisis here. Please also read part 2 and part 3. I know that woodworkers use wood, but we also create beautiful and useful works from it and thereby share a sense of its value. We have an important interpretive role to perform, and simply using wood to share useful beauty is not enough as we watch whole forests destroyed. Today, in addition to inlaying boxes with native hardwoods, I'll be a substitute teacher in the school's building club. We had new gravel put on the Clear Spring School playground, and the bobcat spreading it accidentally damaged the school GaGa court that I'd helped the upper elementary school class build two years ago. The court was pushed out of shape, and a board had been cracked and left jagged on one end. So the upper elementary school students helped in restoring the court. We used my tractor to lift one end so that the kids could push the court back in shape, then cut away a portion of the cracked board and added replacement wood. The game GaGa has become a school favorite, and has been undergoing a renewed interest. The court also serves as an outdoor classroom at times, and is a gathering place for students during recess as the edges of the court are a great sitting height. So, even when the game is not in full play, the court is in use. The game is a good one for schools because children of all ages can play at the same time. The damage to the court turned out to be a good thing, in that a new class was able to make an investment of effort it and feel pride in their work. Today I have the luxury of working alone in my own shop, as I inlay boxes and prepare the parts of boxes for assembly. There is a national movement afoot to opt out of standardized testing, but opting out is not enough of a response and not a good idea for an individual child. At the Eureka Springs elementary school they had 40 days of testing in the last school year. So of the 180 days required by the state. over 22% were spent or spent in part on standardized testing. Add to that time, test prep and test practice, and the curriculum taught to the test, and you can see how the opportunity to follow student interests is a goner. The regimen of standardized testing is so deeply ingrained, that even if a parent preferred that his or her child opt out of the test itself, the adverse effects of standarized testing are inescapable. Would a reasonable parent pull their child out of school for those 40 days? We need a much stronger positive response. Where students are doing real things, no abstract and artificial testing is necessary to provide evidence of real learning. And so the answer is for schools to get real, and to allow students to do real things. I went to the Eureka Springs School board meeting last night and listened to reports on school progress from the various school principals. The main discussion was of our elementary, middle and high school rankings on various standardized tests, comparing our schools' and students' performance with others across the state. One thing the elementary school principal casually mentioned was that standardized tests were administered on 40 days during the school year. Schools in Arkansas are required to offer 178 days of classes, so if you were to do simple math like that expected of a middle school student you would learn that testing interfered with over 22% of instruction time. If 40 days are taken up by testing, how many additional instructional days are also taken away by test preparation? Even if only half as many days were wasted in test prep, how many days were spent teaching to the test? Are you beginning to get the picture? I have no doubts that our teachers, principals, and school board members want to do what's best for our kids. But their hands are tied. Standardized testing is a juggernaut propelled by an educational industry, and individual teachers, even when they disagree with it, in whole or in part, dare not stand in its way. Here in Arkansas, the state board of education has changed tests 3 times in 4 years. To draw comparisons from one year to the next is not accurate, so to spend so much time testing is a needless distraction from real learning. Standardized testing and reliance upon it is standard in all 50 states. It is an attempt to industrialize learning. It is not healthy for the child to spend so much time and so many days distracted from real learning. Nor is it healthy for human culture, which thrives upon diversity of ideas and experience. So, while the standardized testing industry rakes in billion dollar profits at tax payer expense, the real cost is what it's doing to students, schools and human culture. Perhaps worst is the illusion that standardized testing measures anything real. There are aspects of mind regarding the retention of facts that lend themselves to being measured in bubble tests, but there are aspects of character that are just as essential to the child's success that do not. To be so focused on test scores is to ignore the development of the whole child. On the other hand, children left to their own devices learn and reflect. It is a primary aspect of human consciousness. Would it not be best that we put standardized testing aside, give students the tools and inspiration to make beautiful and useful things and allow them to get on with it? Every human being possesses some special endowment which is the strongest of his powers, and the development of which may lead to original production. The one gifted with a strong sense of form and beauty builds a cathedral which is a masterpiece; another with the same kind of gift, only in a lesser degree, contracts tables, vases, or shoes in a perfect manner. Be it great or small, some spark of productive genius dwells in every living being called by the name of man, for a being formed after the image of the Creator must be destined to create. How much, however, of this human creative power fulfills its end, and how much of it is lost, is a calculation which no statistician would be equal to. But what can a state accomplish without cultivated human powers? The feeblest spark of genius may grow into a flame if it receives adequate fuel or nourishment. But this is precisely what is wanting in earliest childhood. We need a revolution in education, but not the one proposed by technocrats and corporate investors. As Bernie Sanders mentioned in a speech on Sunday, those who care for our children in preschools are often trained and paid less than the clerks at MacDonalds. Are children of so little importance to us that they are to be flipped and placed on buns? Young mothers, too, should be trained to take part in a revolution. 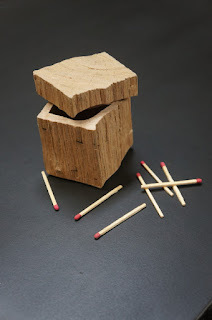 That revolution was what Froebel started in his invention of Kindergarten through which the important role of mothers as the child's first teacher was made known, and through which women were drawn into the profession of teaching for the first time. That revolution also played a great part in the manual training movement as schools attempted to enliven schooling at all levels through making real things and exercising the student's inclination to toward skilled craftsmanship. That revolution fell relatively dormant during the beginnings of the computer age, but while technologies have changed, human beings and the need to learn through the exercise of our creative capacities has not. 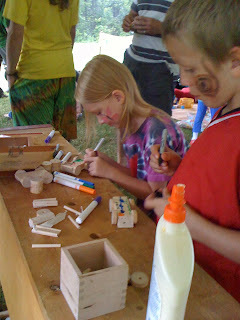 Today in the CSS wood shop, my home schooled students finished their toy making class. It was an interesting class as the boys made things I'd never thought of as toys. One made a small door complete with knob. Another told me, after making a thing that I could not name, that it was 80% complete and that he would finish it at home. My 7th and 8th grade students worked on their bows and arrows and one began making a box. Creative genius is not launched by every student doing the same thing at the same time and to the same standards of mediocrity. Yesterday I began the process of throwing out old CDs and DVDs that brought systems and applications to my computers over several generations of technology. They represent capacity that I was allowed short term license to use (under certain restrictions) but not own. Most of modern technology is following the same direction. As cars and tractors are designed with chips and processors to control their performance, mechanics and owners are finding that the same rules apply. As new development occurs, planned obsolescence sets in to affect old products, and owners discover that they cannot be fixed or operated beyond their planned time. Even toasters can be programmed to force their replacement when the owner of the license wants the consumer to buy a new one. This will mean that objects, no matter how much you care about them, and regardless of how much you take care of them, will expire on a timeline established by others. The inclinations of the craftsman to create lasting beauty and utility, and to shape his or her own intelligence and character at the same time are directly counter to the machinations of the industrialized world, which for all intents and purposes produces things quickly and of short duration, thus assuring our continued dependence on the products of modern technology. The big question of course is how long we will remain complaisant consumers and allow power to be taken from our own hands. Still, the hands will out. * While industry robs the planet of its resources, including the rain that falls and the air we breathe, the craftsman puts back and preserves, and thinks of coming generations, not short term profits. Just as a small power tool can go out of adjustment and mis-cut joints having a greater adverse effect than a simple error in hand tool use, the larger and more complex the system, the more catastrophic the collapse. The ordinary way of getting infants to be quiet and attentive is to make them fold their hands behind them, or put their arms by their sides. Nature impels children to be constantly using their hands; we resort to this unnatural method, to prevent the perpetual "playing with the hands," which takes off the attention from the lessons to be learnt. But anything that is antagonistic to the child's nature is hurtful to it. And in this very instinct to use the hands, if we would only believe it, we have the best possible means of arresting the attention of the child. Froebel has taken this lesson fully to heart, for in all his lessons for young children there is always accompanying action of the hands. The child's nature requires that head-work and hand-work should be combined; that all its knowledge should be obtained by action. *the term "will out" as applied to murder and the truth go back in English literature to Chaucer and Shakespeare. It refers to a thing becoming of public knowledge. The hands, on the one hand have been treated roughly. On the other hand, the hands are the true source of human wisdom and will not be neglected for long unless we are deeply set on damaging the lives of our children and grandchildren. Make, fix, create and extend the power to learn likewise. Yesterday I was working on some doors to turn a book case in to a pantry, and decided to take the easy route by using a biscuit joiner to attach the stiles and rails. Unfortunately, the biscuit joiner went out of adjustment part way through and began cutting slots that would not match the previously cut parts. First thing today I'll be fixing what the machine screwed up. The entire thrust of technology whether we are talking about digital technology or woodworking tools is to make work easier, faster, and to eliminate risk of failure or injury. But when machines screw up for one reason or another, the results are often worse than with skilled hand tool work. In the meantime, doing difficult things, not easy stuff, offers growth in understanding, character and intellect. Technology, however smart it may be, can leave us acting smart and really dumb. One of the big problems with mechanization is that when things go wrong, they go disastrously wrong, and may have effect on a number of parts before the defect is noticed by the operator. On the other hand, sometimes machine error brings interesting effects. For example, my illustration above showing Keats' concept of negative capability has become animated through no fault of my own. For some reason when it was saved, my iPhone kept a series of images in one file, leading to it performing as an animated jpeg. You can see how the basic illustration evolved as well as the layering of concepts that took place. What exactly is all this about? You can refer to the original blog posts in which I discussed negative capability. Here and here. We know more than we think we do in that what has for the sake of convenience been called the right brain, can't really explain what it knows to the left, and yet what it knows is known. 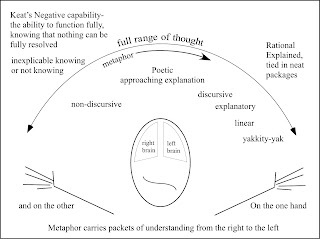 Metaphor is the vehicle through which the right brain alerts the left to possibilities it cannot grasp on its own. The hands are active participants in the transfer of knowing from one side to the other. For Keats, "several things dovetailed" in his mind. He may or may not have been a woodworker, but at least he tried to talk like one. The nature of the individual is similar to that of his race, and the expression of the being and the nature of universal humanity is the measure of the being and nature of the individual. As nature has given to children this instinct of perpetual movement in order that their limbs may be developed and strengthened, so likewise has she implanted in them a desire to touch and examine all the objects surrounding them in order that by this means, they may collect experiences concerning the qualities of materials, and learn to distinguish between hard and soft, brittle and pliable, etc. But the educational guidance which shall turn these instincts to their destined purpose is indispensable. The preceding was published by the Countess as she was promoting Kindergarten and early childhood education while Montessori was but 12 years old. My point here is not to disparage Montessori or followers of Montessori education but to awaken readers to the origins of progressive education. To think that early childhood education was invented by Montessori would be to miss nearly 100 years of earlier development that subsequent development should take in mind. If a teacher begins to understand the relationship between hands and mind, as Von Marenholtz Bülow hoped, he or she must ask whether or not students' hands have been successfully engaged in each lesson. If you don't see the hands at work, the mind may not be working either. Make, fix, create, and insist others learn likewise. A solution for the inefficacy of conventional education. The hands are the primary means of engagement of mind in the world. If you have any doubt of this, take a few moments to observe a child at play. If your doubt is not erased by those few moments, take a moment more to observe your own hands. Not only do they sense the reality that surrounds you, they test and frame whatever thoughts you may have. On the less conscious side, observe how your hands move (and are required to move) as you speak. Gestures draw forth ideas that may have been hard to pull from the mind. Gestures express to others the force and certainty of your ideas. And yet, we design educational institutions and classes in which the hand are left idle, and incapable of testing and discerning truth. The simple first step in overcoming the inefficacy of conventional education is simply to take stock. First come to an understanding of the species of which we are part. The mind and hands of our species evolved simultaneously in coordination with each other as a system for learning and shaping physical and cultural realities. If anyone is incapable of understanding that one simple thing, they do not belong in education. The second step is to design learning with the hand in mind. A simple way to do that is to restore making as a primary activity in school at all levels. I was asked by a reader for a link to Von Marenholtz-Bülow's book Hand Work & Head Work. This book can be downloaded for any reader, or read from your computer screen. It is also available as a reprint from bookfinder.com. Nearly all the great wisdom of the past acknowledged the role of the hands in acquiring it. 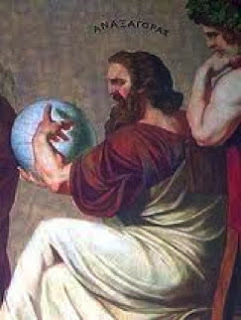 Anaxagoras (shown above) had said that man is the wisest of all animals because he has hands. 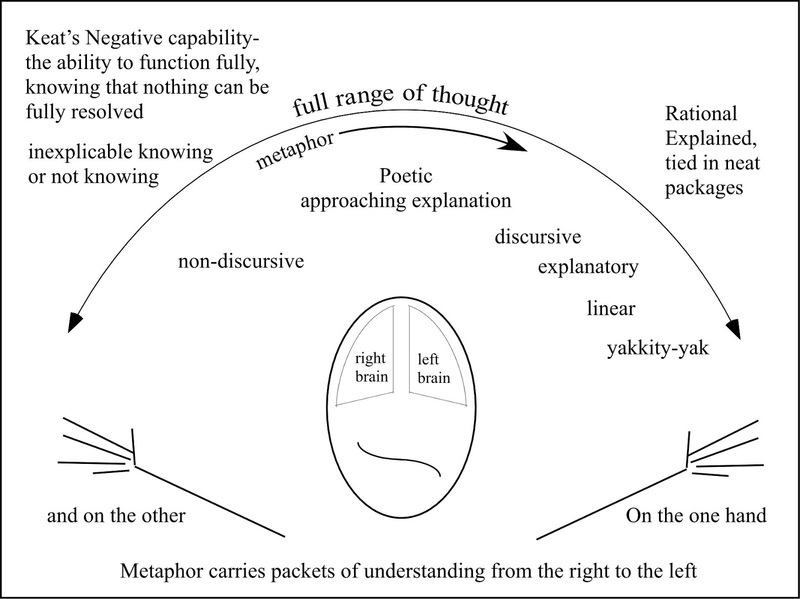 The illustration at left is from one of my prior attempts to explain how the hands are engaged in thought. Today my wife and I (with friends) will attend an open house at Red Fern Studio, where my friend Ed creates beautiful hand blown glass. An interesting book that all involved in education should read is Hand Work & Head Work, Their Relation to One Another and the Reform of Education According to the Principles of Frobel by Countess Bertha Von Marenholtz Bülow, 1883. It is available as a free download from Google books. The development of the human race did not certainly begin with learning in the sense of school-learning. Before human beings had books and schools, they were obliged to procure for themselves the satisfaction of their immediate necessities— shelter, food, and clothing. The beginnings of human knowledge were the result of the experiences which our ancestors thus collected together. Voyages of discovery in their own neighbourhood, observation of the products of nature, investigations concerning the properties of things, and accidental discoveries, and inventions by the way—these were the ways in which the culture of our race began, this was its first educational work, the preparatory school out of which science and art have arisen. Our present systems of education have certainly deviated very far from the natural method by which the Divine Educator has led the human race, or they, too, would begin with work and not with learning—work, i.e., in the sense in which all development may be said to be a species of work, viz., movement, activity, exertion, which result in the letting loose of bound-up an innate striving after growth which conduces to the progress of the universe. The point here is that education has become steeped in artificiality, which we see replicated throughout human life. That artificiality places human culture at odds with the natural world upon which we depend. Friedrich Froebel had attempted to devise a system of education that conformed to natural laws, illuminated those laws for educational purposes, which was to then lead to a more effective, harmonious and just society. His system won the attention of just a few devoted followers like Countess Von Bülow who then brought it to the world. One can argue that the times have changed, and yet the hands remain the instruments through which we learn of the world and its wonders. To ignore the role of the hands in learning is education's first and greatest mistake. In the wood shop today, I will be making boxes. I realized as I was milling parts yesterday and reviewing orders that there was one box size I had overlooked in my preparation of stock. Thanks to my 4 position router table, catching up with those parts will be a breeze. Yesterday my only reluctant woodworker, a first grader, began playing with scrap wood and suddenly decided on something she wanted to make. Every other class up to this point, she's complained that she doesn't like woodworking. She would sit quietly and pout while the other students were joyfully at work. Making bunkbeds for her barbie seems to have turned the tide. In yesterday's blog post when I mentioned children who might be thought good because they sit so quietly and cause so little trouble, I was thinking of this child. But all good things begin with the interests of the child, and this one just needed a bit of space to allow the joy of woodworking and creativity to get a grip. In the later afternoon class my students were working on their archery bows, and two students got to the point of gluing them together. Ozric proclaimed his excitement: "this is just like Christmas day." "All work, all exercises which awaken the active powers," writes Baroness von Marenholtz-Bulow, "which form the capacity for rendering loving services to fellow-creatures, will help to lay the groundwork of religion in the child. The awakening of love goes before that of faith; he who does not love cannot believe, for it is love that discovers to us the object or the being worthy of our faith. Loving self-surrender to what is higher than ourselves, to the highest of all, is the beginning of faith. But love must show itself in deeds, and this will be impossible unless there be the ability to do. A child can no more be educated to a life of religion and faith without the exercise of personal activity than heroic deeds can be accomplished by words only." There may be some who think that being good means doing nothing. I had wondered about the saying that the idle hands are the devil's workshop. What about the hands proclivity to make mischief? but when we wake up from from our idle distractions to the real world that surrounds us, we find that there are important things to do in service of family and community. To sit back doing nothing is a waste of human potential, and the do nothing approach to classroom learning is a great waste. The great thing is that as we realize our own creative potential, it feels just like Christmas day, even if it is just the 15th of October. I had promised a photo of my 4 position router table designed for making my production boxes. I started this router table years ago, but never had enough routers to put it to use until recently. It is designed to rout mortises in box ends, and tenons on the ends of the box fronts and backs, as well as to rout the edges of parts and the completed box. The routers are mounted directly to particle board panels covered in formica. These lift out of the larger table for changing of bits. Two pivot fences are used for routing the mortises and tiny tenons to join box sides. The low fences are for use of roundover bits. The four routers are controlled through the panel of switches shown at the front. Drawers below hold router accessories and parts for box making. The whole thing plugs into a vacuum that turns on and off automatically with the switches on the front. Whittling the end of a bow. I have a class of home schooled boys meeting in the Clear Spring School woodshop on Tuesdays (for one more week). The object of the class was to make toys, but following the interests of these boys, led us all astray. Yesterday I had made a model semi-truck as an example of what they could make, and in a more structured situation, I might have insisted that they do what I had planned for them. Instead, they wanted to carve on the bowls they had started in the previous week, and when one discovered that a thin board could be cut to better resemble a sword, the others followed along. One boy made 4 small wooden swords and a light saber. Two swords were for his sister, one each for his mom and dad, and the light saber he planned to keep for himself. With that many swords made, he was so proud of his work he was ready to go home. So I showed him how to carve a stick to a point with a knife. At the close of class I counseled the boys on the responsible use of toy swords and sharp sticks and turned them over to their mothers. That raises the question, will the mothers be too frightened to bring them back for the last class? Work from the easy to the more difficult. Work from the simple to the complex. Rely consistently on the concrete to illuminate and test the abstract. This morning my home school students made swords and learned to whittle sharp sticks, and this afternoon, I'll help students to make bows and arrows. The knife has become a favored instrument at Clear Spring School. "As no material part of the human spirit, of the artist, is in the work of art, and yet the work of art bears within it the whole spirit of its artist, so that he lives in it, expresses himself by it; and as the work breathes forth again his spirit even to others, is awakened, developed, improved, and formed by his spirit; as thus the man's spirit is related to the work produced by him, as the man (as a spirit) is related to that which he has produced, so is the spirit of God related to nature, and to all created things. The spirit of God rests, lives, and works in nature, expresses itself by nature, imparts itself through nature, continues to shape itself (to give itself visible form) in and by nature; but nature is not the body of God." The following (as was the preceding quote) is from H. Courthope Bowen's book, Froebel and Education Through Self-Activity, 1892. General morality, as we have seen, is held by Froebel to depend largely on having the ideal side of the human being awakened and gratified from the very beginning of life, in order to afford a counterpoise to sensual desires, and to delay or prevent as far as possible the awakening of the lower appetites. The development of the sense of beauty, while the reflective powers are still slumbering in the child's soul, offers the best means for this. Therefore, from the earliest infancy onward, the eyes of the child are to be opened to forms, colors, etc., and its ear to music; and the weak, childish powers are to be prepared and used in the formation and creation of beautiful objects. Here again creativeness is to render the soul susceptible to the ideal. While, moreover, the principles which underlie the formation of beauty will, in this way, be brought home to the worker, and will be another experience in the beneficent results of law and harmony; for beauty is the perfection of a thing after its kind. In public education today, goodness is too often confused with inactivity. Managing a large classroom of students and getting them to sit quietly is considered the mark of a successful teacher. But according to Froebel, the child under such circumstances is "thus reduced to inaction—often mistaken for goodness." 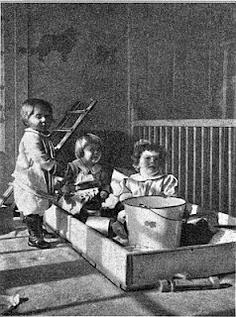 Froebel compared children under such circumstances "to the butterfly or beetle, which, from much handling, is feeble, and indeed also footless, and which the little boy pronounces to be 'quite tame now." 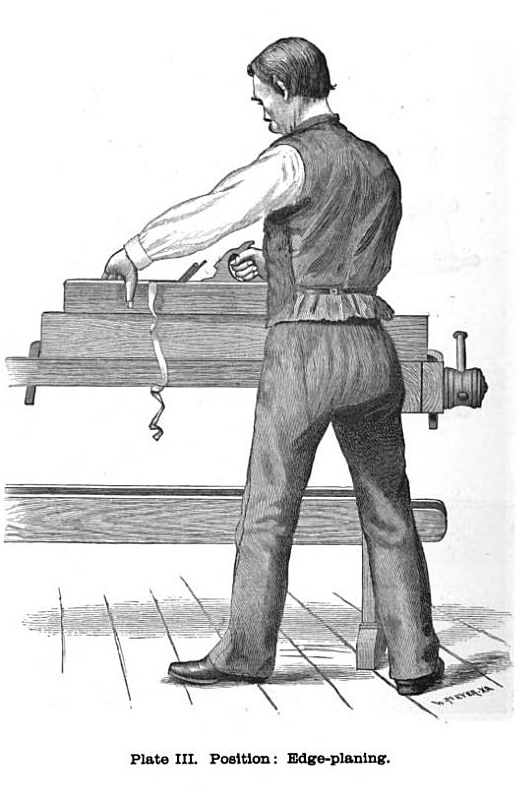 Friedrich Adolph Wilhelm Diesterweg was not specifically an advocate for manual training, but was one of the philosophical influences that Cygnaeus drew upon in the formation of the Finnish Folk Schools. Diesterweg was a prolific writer, with his most notable works being on the role of the Volksshcule (folk school) in the promotion of democracy. As with Friedrich Froebel's Kindergartens, the Kaiser shut his schools down, too. Progressive education and an intelligent populace are inconsistent with the aims of militarism and authoritarianism. Teach naturally! Organize instruction according to the natural developmental stages of the children. Start teaching from the pupil's point of view and direct his progress steadily, firmly and thoroughly. Do not teach anything for which the pupil is not yet ready and do not teach anything with which he is already familiar. Teach in a lively manner. Proceed from the familiar to the unusual, from the simple to the complex, from the easy to the difficult, from the known to the unknown. Do not teach in an academic way (in other words, the lecture-type teaching methods used in higher educational institutions), but simply! Always remember that you are aiming at the abstract (increasing the intellectual capacity) and the material (provision of the curriculum) at the same time. You will see in the quote from Diesterweg, Salomon's reliance upon his writings for the Theory of Educational Sloyd. In that specific quote you can find the 5 principles of Educational Sloyd. Start with the interests of the child, move from the known to the unknown, from the easy to the more difficult, from the simple to the complex, and from the concrete to the abstract. Diesterweg has been attributed as author for the command, "Learn to do by doing," a phrase that simplified what Comenius had said in the 17th century. 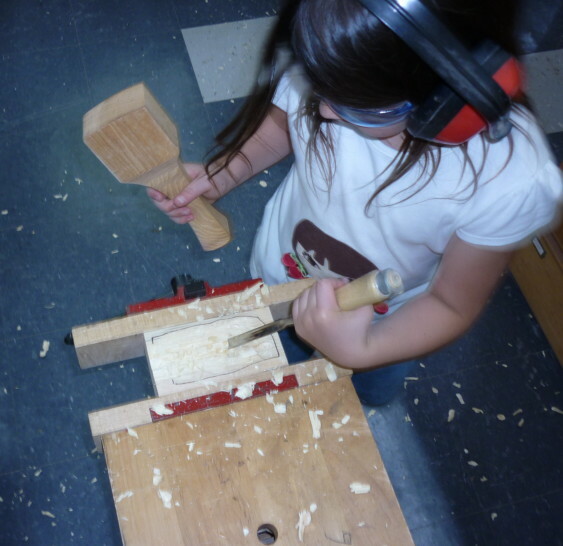 Today in wood shop at Clear Spring School, students will continue making bows and arrows. Lower elementary school students will make African masks, and middle school students will begin making cherry cutting boards in the shape of Arkansas. Make, fix create, and encourage others to learn likewise. These days the concept of God no longer plays much role in secular educational thought. In fact, Adolph Diesterweg was an early advocate of the separation between schooling and religion. So the conversation between Froebel and Diesterweg is relevant even today. The idea that learning must lead beyond ourselves into feelings of connectedness with human culture and with the world of nature and of all else should be a simple matter of material concern in education. It is not necessary that schooling be tied to and utilized as a means of indoctrination in particular religious faiths in order to lead students to a sense of their own connectedness. The child must learn to get along with others. The child must learn to be respectful of human rights and be led to shoulder the burdens of adult responsibilities. The child must learn to see self in others and discover his or her place in the wholeness of life. And so whether or not a school is secular or non-secular, the responsibilities are the same, and even without reliance on the concept "God," children can discover both morality and what Froebel identified as "connectedness." Those learnings are not effectively conveyed to modern kids through idle lecturing on values or by preaching on gospels or other ancient texts. Children learn about their own connectedness through doing real things. Schooling must lead children to discover that they have important roles to play in larger things. The cartoon shown above, illustrates the stark contrast between what education has become and what it might be. Make, fix, create, and discover your own role in helping others to learn likewise. As a part of making boxes to fill orders and supply the small galleries that sell my work, I make inlay just as I've taught so many to do through books and classes. I've refined my technique recently by being less diligent in my application of glue. I've stopped spreading it and simply apply it with a squeeze bottle and push the parts together in a line. It has cut my assembly time in half. And so, by doing things again and again, and looking at what we do with fresh eyes, the wheels of progress turn. The two photos here show steps in the process, starting with rough wood, and blending species into patterns. These days, connectedness might be mistakenly thought to describe the young woman or man with eyes glued to the small screen of a cellular device while the natural world around them swirls unseen. Please believe me when I tell you that's not at all what Froebel had in mind. To have all the information in the world at your fingertips and to do nothing meaningful with it, is a waste. I know that I write too much for most readers but things come up that may bear repetition. The OECD tested students in various nations to determine the value of digital technology on their students' learning. So far, the rush to digital learning has not born fruit. Their conclusion? Computers "do not improve' pupil results. It is a rainy morning in Arkansas, with fall weather having brought an end to late summer drought. Each year at this time, I get an order from Appalachian Spring Galleries in Washington, DC and have to turn my attention to making boxes for sale. So yesterday I cut rough walnut and basswood into appropriate widths, and resawed them into thinner stock for box ends, bottoms and sides. It is a soothing process, as I've done it so many times before. After the parts are cut to length I'll put my new 4 position router table through its paces. It is a router table with 4 routers in it, each set up to do a step in the making of these boxes. The idea is that having the tools set up and dedicated to certain steps will allow me to quickly make boxes in the various sizes required. I woke up in the night thinking about Freidrich Frobel and the need I have to clarify his thoughts so they can be easily conveyed for a fresh generation. He had 4 main themes. One was connectedness. He believed that knowledge was diminished when it was compartmentalized and isolated from the broader scheme of things, and that one particular duty of education was to bring the child tightly into the fold of civilization and to exercise responsibility in the natural world. A second point could be called continuity. The child's flow of learning should be continuous from one age to another, and in order to do that, he arranged the gifts in an order natural to the child's growing mind, and intellectual capacity. Followers of Froebel envisioned manual arts in school as the means to extend Kindergarten style learning beyond the Kindergarten age. A third point is creativeness. 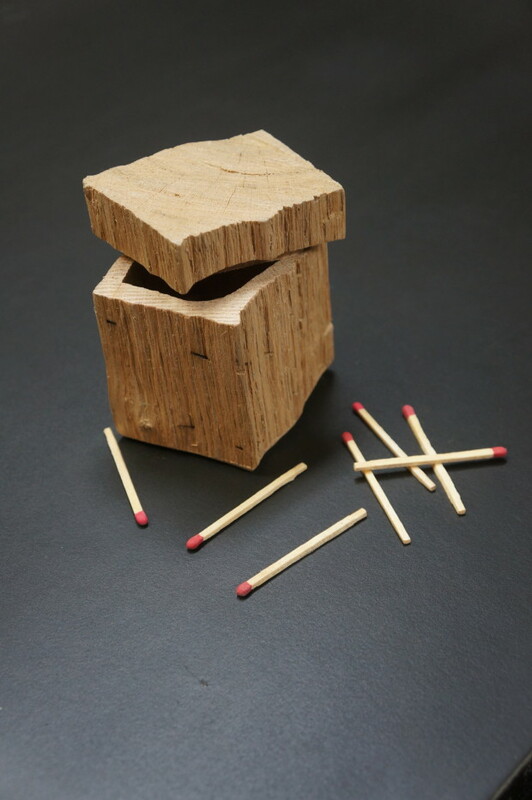 Not only was the child to learn by example and instruction, Froebel recognized that learning was best measured and expanded in the child's life and for the sake of human culture by what the child did in response to learning. Education in which the child passively received instruction or laerned merely from books and was not afforded the opportunity to test what was learned was considered "one-sided" and incomplete. Froebel's fourth and overarching point was the doctrine of self-activity. That is truly where the hands come into play. For activity is the direct opposite of the passivity enforced by most schooling. The lower elementary school at Clear Spring School is studying Africa, and the students suggested making African masks from wood in woodshop. They were making paper masks, but upon hearing that the originals were wood, making them in woodshop seemed natural. So I prepared the stock and made a sample mask, but only one student began work on one. 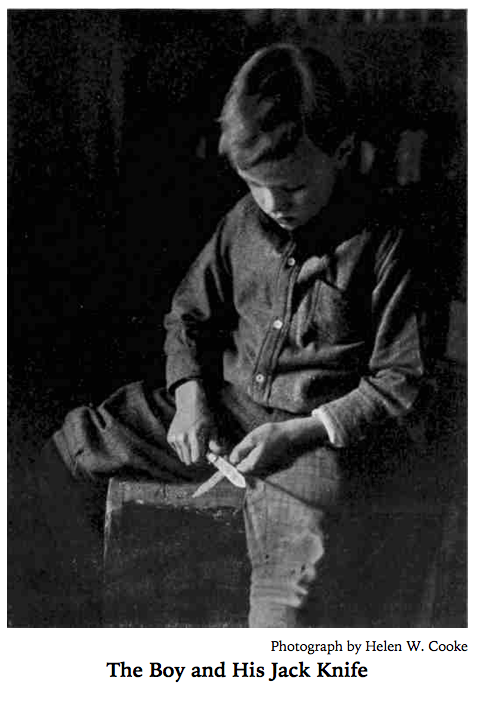 The others were more insistent on practicing whittling in preparation for their overnight camping trip that begins today. My upper school students worked on their arrows and began shaping bows. The masks are quite simple to make using a coopering technique and hand planes. I ripped pieces 1/4 in. thick from the side of a 2 x 4 and then cut staves in a uniform length. We beveled the edges with planes until they (when assembled) created a curved form. We used masking tape to hold the parts together during a design process in which the student drew a shape on the wood. After designing the overall shape and cutting it with a scrollsaw, we taped the joints with masking tape on one side and then spread glue between the parts on the other. With a well planed joint, glue and masking tape are enough to hold the mask together while the glue sets. When the glue has fully set, the mask will be strong enough for sanding, further shaping, paint, and to serve as evidence of learning. One of the masks below was one my student designed and made. The others are ones I made for demonstration and fun. Can you guess which is which? Now some of my high school students want to make masks in addition to arrows. The process of creating useful and/or beautiful works using hand tools and wood is addictive. Make, fix, create, and share with others the opportunity to learn likewise. Yesterday my home school students began carving bowls. One had finished the toy robot he was making and said, "I want to make a bowl." I thought we were toy making, but he had something more practical in mind, and I had the right tools at hand. The next thing I knew, all the boys in the class wanted mallets and chisels to carve bowls. They know very little about what they are doing, but as long as the wood is safely held in the vise, it is a relatively safe operation, and one that will lead to observation and investigation. Two of my 7th and 8th grade class began making bows while the others finished their arrows. Their work is not as lovely as arrows made by experienced fletchers. Skill is not a thing that arrives without practice. Today in various classes, students will begin making African masks and and continue work on bows and arrows. Many years ago, before I became a craftsman, I read A. S. Neil's book Summerhill, about a small independent school in the UK. I did not know at the time, that I would later teach woodworking in a school that so closely resembles Summerhill in spirit if not in location. Clear Spring School is its very own thing, and not a deliberate clone of any other school, but like Summerhill has stimulated the imaginations of those who would want more for our children from education than they get in public schooling today, I hope that Clear Spring School may grow at least as famous as Summerhill was and serve to inspire a whole new generation of parents and educators. Today the students at Clear Spring School finished their wooden dinosaurs with the exception of two students who have been lagging behind. Others continued work on their arrows and are getting excited about making bows. After I showed a youtube video of a craftsman making an arrow using sharp stones to work the shaft, one of my students slipped out of the classroom and I found him at work on the creek bank. He decided that his own arrows should be made in a more primitive do-it-himself manner. In some schools he would have been in trouble for that, whereas it would be my preference that students discover their own creative capacities and become carried away in self-activity thus taking learning into their own hands. When I go to family reunions, I enjoy talking with my sister, Mary who teaches in the Lincoln, Nebraska public school system. She is intelligent, thoughtful, and passionate about teaching and dedicated to her students. Her students come from difficult situations, and yet teachers are allowed to make no excuses for the challenges they face. They are supposed to trudge on despite the number of students they have that come from single family homes in which some children have a history of abuse or neglect, and many will never have the opportunities shared by those students from the upper classes. So if you think of education as one would a train, by the time then engine manages to get the cars up to speed those with challenging home lives may not make it even to the caboose but for dedicated teachers like my sister reaching back to pull them up. "In the 18 years before the 1996 reforms, Australia suffered 13 gun massacres - each with more than four victims - causing a total of 102 deaths. There has not been a single massacre in that category since 1996." Let's compare this with the US, where opposition to gun control is strong, and folks are frightened that the government will enact reform. In Australia people voluntarily turned in guns in an effort to build a safer society in which children could live without fear. guns, more guns and stuff happens? I am in DesMoines, Iowa, and on my way to a family reunion, but was not surprised to learn on the news of yet another incident of gun violence. Weeks ago, I listened to a segment on NPR in which insurance companies seemed to be taking a rational approach to gun violence. If you have guns in the home you will likely pay higher rates commensurate to the actual risk your choices make the insurer face. Studies indicate that having a gun in your home increases the likelihood of gun violence, either by murder or suicide. So insurance companies (where such questions are not prohibited by state law) are taking a scientific view of the problem and analyze risk based on decisions policy holders make concerning gun ownership, whereas politicians have an emotional response and take fixed positions that lock and load our nation in endless debate. And so more and more "stuff happens" which is the way some politicians (Bush and Trump) describe the endless rounds of personal tragedy that terrorize our kids. This year at Clear Spring School, students in the upper elementary class were asked what they feared. One student new to CSS named gun violence in schools as being her biggest fear. Do you think that is an uncommon thing? And does anyone really think that a child's fear of gun violence would be alleviated by the presence of more and more guns? I realize that not all my readers agree with me on the subject of guns but if insurance companies recognize a clear danger from having guns in our homes, why can't we deal with the problem of gun violence and never have the fear of violence face the children in our schools? Let's do something about the problem, even if it requires changing minds to do so. In the meantime, a beautiful tool can be as engaging as a gun, but leads not to risk, but toward the creation of beauty. Last night the head of school of Clear Spring School asked me if I felt that our students have a sense of gratitude to the school. It may be quite common for kids to feel something for their school, and yet, young ones often lack a frame of reference, and gratitude is usually a feeling that comes through comparison with other situations that may be worse. Gratitude may also suggest an indebtedness. So when children are joyful and responsive and under the care of adults who feel empathy toward them, it may not be necessary that they feel gratitude. Yesterday one of our first grade students was standing alone with her arms crossed and a purposeful pout intended to express anger. She explained to me that she and another student "had a fight," and that the other student had forgiven her but that she was not quite ready to forgive the other student... who by that time was on the jungle gym and having a great time. "How long do you plan to hold out and not forgive," I asked. "Until recess is over." the girl asserted firmly with here arms tightening across her chest. Anyone with a sense of empathy and compassion would enjoy being with these kids, and that's not to assert there is anything particularly remarkable about them. There are children all over the world that deserve the kind of learning environment that you can find at the Clear Spring School. So when it comes to gratitude, I realize that I am a very lucky man. Richard Bazeley sent this image of a ship made by a boy who had been termed a "difficult or disengaged student," one that in the US we might call special needs. I am reminded of three things. One is that some children walk at 10 months, and some as late as 18 to 24 months, and the pediatrician will assure the parent that everything is fine. There is a normal range at which children take to their feet. Can there not also be a normal range at which a child is ready for classroom learning? If the range is so great at such an early age, is it not likely that a particular range of development would widen rather narrow as a student reached school age? And if that is the case, one might wonder what damages are done as we force children to fit. Years ago one of my early mentor's in education had referred to Procrustes, a Greek monster who had a bed upon which he would invite guest to lay. The bed was equipped with chains to stretch those who were too short, and a giant knife to trim the legs of those who are too long. My friend John described education in the US as a "Procrustian bed." It may be perfectly comfortable if you are one of those lucky enough to fit. I am also reminded of a hand-made book that I purchased for a dollar at the Carnegie Public Library book sale a few years back. It is a book of tiny etchings on hand-made paper, hand-bound and printed in a tiny limited edition as a graduate's thesis in the arts. The woman who made it had been diagnosed as severely retarded and placed in an institution. After several years there, a nurse noticed the 4 year-old child under a table having made a tiny dog sculpted from a small scrap of modeling clay. The nurse immediately recognized from that tiny sculpture that the girl was not retarded. Further investigation led the staff to the realization that was deaf. The book was the story, told in images of her being awakened from the hell in which she had been placed. I'll not say that schools are quite that bad. But I will inform you that when we place children in untenable situations that do not meet with their levels of readiness to learn, we have done them a disservice. Children do not mature at the same rate, and just as one child walks at one age and another matures to that at a slower pace, children's brains do not mature at the same time either. Schools could do a better job of easing up and making allowances for children to fit in at their own paces, and we would all be made better for it.